10 Top Reasons To Buy A Daytona Beach Condo! 1. You hate mowing your lawn. 2. In addition, you hate to trim, pull weeds, and paint your home. 3. You travel a lot for your job or for your sanity. 4. You have all these hobbies you want to pursue. 5. You have been renting for years and you feel you are wasting money. 6. You want a pool and can’t afford it and definitely don't want the maintennance of your own! 7. You want 3000 square foot of living sapce but can’t afford it. 8. You have few friends and want to meet new people. 9. There’s some great deals right now in the condo market! 10.You want to ensure your community adheres to rules and regulations. Team Gagliardi.com is a terrific resource for those looking for Daytona Beach condos and Daytona Beach vacation homes. Daytona Beach is world famous for being the home of NASCAR and sandy beaches. Aside from the high excitement of the racetrack, guests of Daytona Beach condos are treated to a lively nightlife of clubs, bars and fine dining restaurants. The beaches offer excellent conditions for surfing, boating, jet-skiing, sailing, parasailing, and snorkeling. 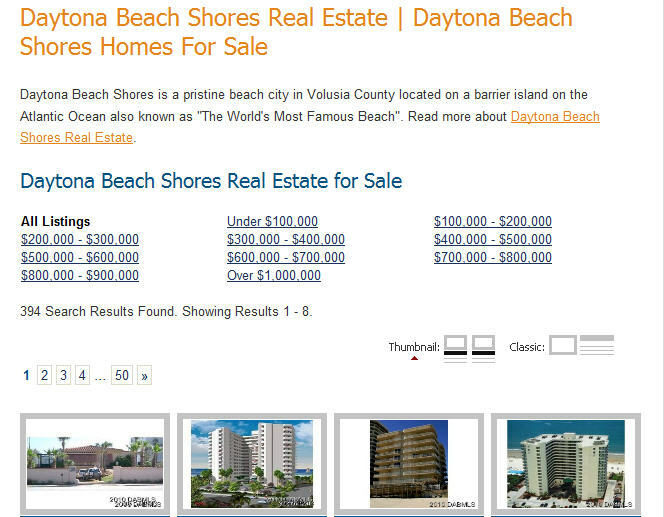 When you are looking for Daytona Beach condos and Daytona Beach vacation homes. Whether buying or selling Daytona Beach real estate, you can't choose better than Team Gagliardi. Contact one of the Gagliardi Team members to start your search for the perfect condo today!